For those who do not know the subtle differences between museum collections and archival management, it would seem that such a jump from museums to archives would not be overly challenging. At least, that’s what my cohorts and I thought when this class began. However, we quickly found that what is done within the walls of the Texas Collection is very different from what we initially envisioned. Galbraith processed the papers of James Kendrick Jr., a Wacoan, Baylor student, and WWII veteran. Armed with tentative knowledge about archival processing, ethics, and theory, along with much needed help (and some emotional support) from Dr. Holcomb and Paul Fisher, Processing Archivist at the Texas Collection, we began processing our assigned collections. Some collections were only a few document boxes, while others took up an entire length of a table. Each brought its own complications, roadblocks, and frustrations. In order to process our collections, we were required to create an initial inventory. Then we grouped and described the records by series based on theme or material type. This differs from museums because in that setting, each item in a collection is given its own accession (or identification) number, and then cataloged or described individually. Another big difference between the two is that in archives, some items are disposed of due to redundancy, condition, or irrelevance. While this is common practice in the archival world, it left our heads spinning! 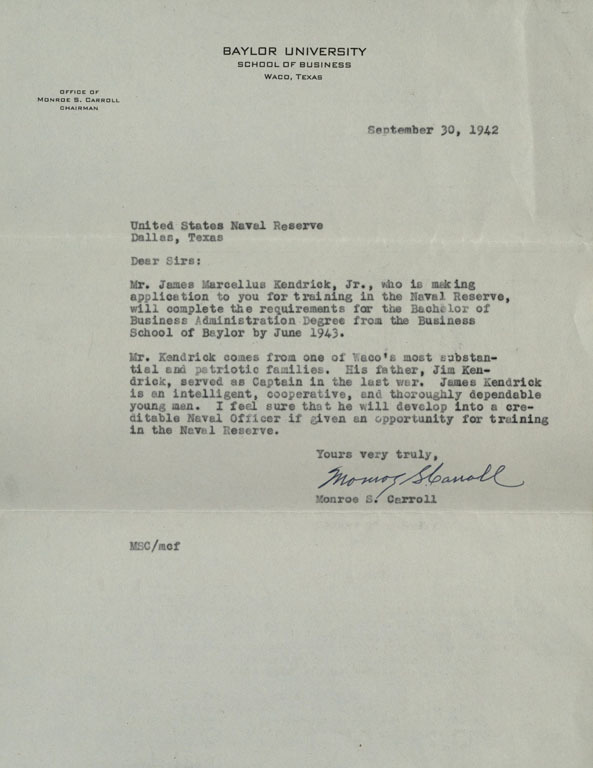 Personally, I was given the task of processing the James M. Kendrick, Jr. Papers, a records group which initially included five document boxes filled to the brim with random clutter and materials spanning from correspondence to financial productions and everything in between. I would be lying if I said that I was not overwhelmed that first day of processing in late August. 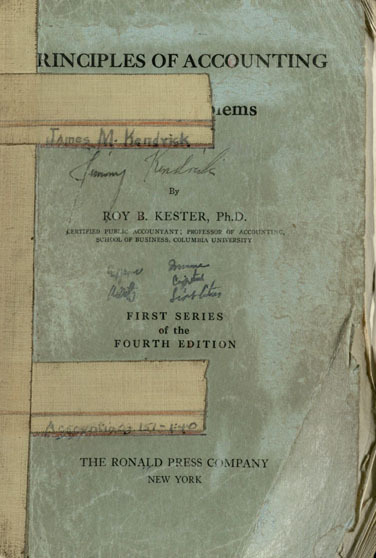 Items of interest in Kendrick’s papers include his very worn copy of an accounting textbook, which can be used to learn how business education was taught in the 1940s. However, I soon found that by operating at a slow and steady pace––taking each box and each material type one at a time––that the collection was not as frightening as I originally thought. Furthermore, as I began to piece the collection together I realized I was learning a lot about Kendrick. James M. Kendrick, Jr. came from a prominent family within the city of Waco: his great-grandfather fought in the Civil War, his grandfather was an esteemed Baptist minister, and his father was a strong presence in the early Waco business community. However, Kendrick’s records did not focus on grand achievements, nor did it initially scream of overwhelming historical significance. My collection mostly focused on Kendrick’s time as a student at Baylor, and his journey from adolescence to manhood. 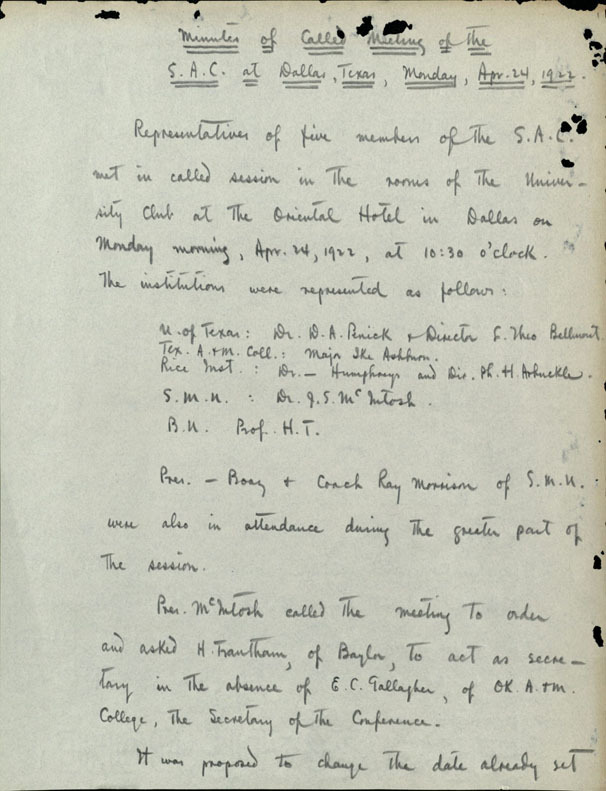 The archives offered very interesting insight into the world of a college student in the late 1930s and early 1940s, and highlights the all too real ups and downs of a Baylor student required to balance school work, campus organizational responsibilities, family life, and friendships. While Kendrick was living during a time torn by WWII, and actually entered the service after graduation in 1943, I felt that, even in 2012, I could relate to many of his daily dilemmas. Overall, I gained some wonderful experience out of the class, as did my other Museum Studies peers. 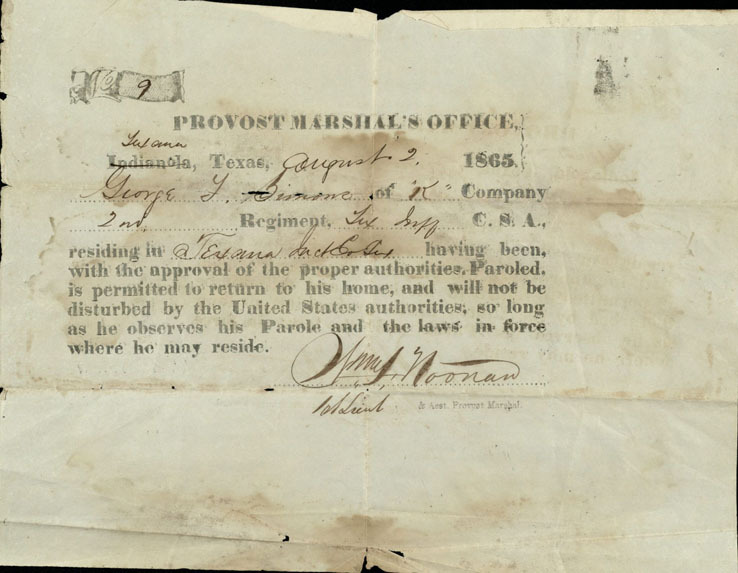 Not only did we learn some great lessons about archival processing, we also gained some great connections within The Texas Collection, as well as an online publication with our finding aids on The Texas Collection’s website. I urge you all to go take a look at what we accomplished!